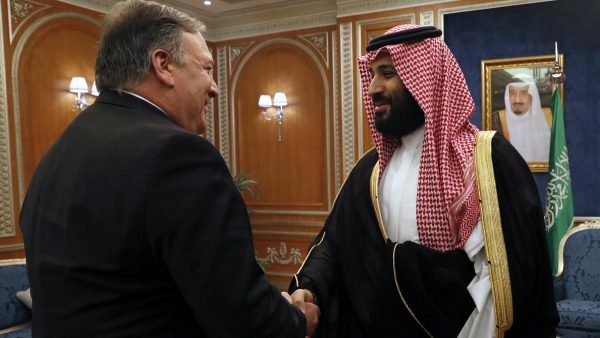 U.S. Secretary of State Mike Pompeo met Saudi Arabia’s king and crown prince to discuss the disappearance of journalist Jamal Khashoggi on Tuesday and Turkey’s foreign minister said the envoy would bring information about the case to Ankara. Khashoggi, a U.S. resident and leading critic of the Saudi crown prince, vanished after entering the Saudi consulate in Istanbul on Oct. 2. Turkish officials say they believe the Saudi journalist was murdered there and his body removed, which the Saudis strongly deny. President Donald Trump, who dispatched Pompeo to Riyadh amid strained ties with the key ally, has speculated that “rogue killers” may be responsible after speaking with King Salman. After talks with the king, Pompeo met Foreign Minister Adel al-Jubeir and will see Crown Prince Mohammed bin Salman for a second time at a dinner. He is then expected to go to Turkey. They will continue on Tuesday, expanding their search to include the residence of the Saudi consul as well as consulate vehicles, Turkey’s Foreign Minister Mevlut Cavusoglu said. Turkish President Tayyip Erdogan, speaking to reporters in parliament, raised the possibility that parts of the consulate had been repainted since Khashoggi disappeared. “The investigation is looking into many things such as toxic materials and those materials being removed by painting them over,” he said. The case has provoked an international outcry against the world’s top oil exporter, with media and business executives pulling out of an investment conference next week. During the initial consulate search, CNN reported on Monday that Saudi Arabia was preparing to acknowledge Khashoggi’s death in a botched interrogation, after denying for two weeks any role in his disappearance. Cavusoglu said Turkey had “not received a confession” yet from Saudi Arabia over Kashoggi’s disappearance, but added that he expected Pompeo to bring fresh information from Riyadh when he arrives in Turkey. Some 10 Turkish investigators left the consulate before 5 am (0200 GMT) after searching the premises overnight, and a Turkish prosecutor departed around 1-1/2 hours later, followed shortly after by a Saudi team. Forensic vehicles took away soil samples as well as a metal door from the garden, a Reuters witness said. A police dog was part of the search team. “The Turkish crime scene investigators carried out searches in the consulate and took the things deemed necessary,” a senior Turkish official said, after acknowledging the difficulty of collecting evidence 13 days after the alleged incident. Trump has threatened “severe punishment” if it turns out Khashoggi was killed in the consulate, but ruled out cancelling arms deals worth tens of billions of dollars. European allies have urged accountability for those responsible. Saudi Arabia has said it would retaliate against any pressure or economic sanctions “with greater action,” and Arab allies rallied to support it. The insider never shied away from criticizing Saudi policies but gained prominence in many circles, including as an adviser to former Saudi intelligence chief Prince Turki al-Faisal. Members of Khashoggi’s family have called for “an independent and impartial international” investigation. Khashoggi’s fiancee Hatice Cengiz, who was waiting outside the consulate the day he disappeared, tweeted a Koranic verse warning those who kill on purpose, with the hashtag “Jamal is the Martyr of the Word”.